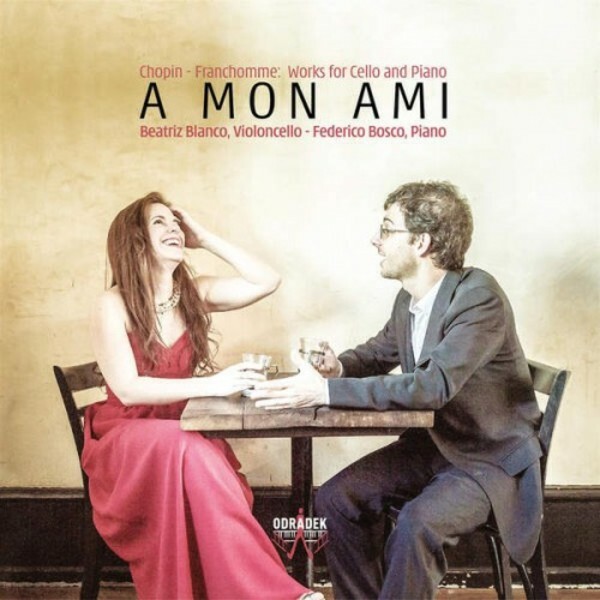 Award-winning duo Beatriz Blanco (cello) and Federico Bosco (piano) have devoted their debut CD with Odradek Records to an exploration of the music and friendship of Chopin and Franchomme. Chopin's piano music is justly celebrated, but his music for cello and piano is less well known. Any listeners unfamiliar with this facet of Chopin's repertoire are bound to be delighted by this disc. His enchanting Introduction and Polonaise brillante, written early in his career, opens with a witty Introduction in which the cello plays with our expectations before unfolding a gorgeous, singing melody. A perfect choice for a Polish composer such as Chopin, the Polonaise (Polish dance) sparkles with vivacious musical conversation. Chopin was inspired to write his Cello Sonata for Auguste Franchomme, whom he had met in 1832. Franchomme was an outstanding cellist who became one of Chopin's best and most loyal friends. The Sonata is one of Chopin's later works, and was performed by Franchomme at Chopin's final concert in Paris. The opening movement is noble and rich, with the autumnal melancholy one would expect from a composer nearing the end of his life. Yet the lively Scherzo demonstrates that Chopin's powers were undiminished, the two instruments intertwining in music of mercurial intricacy. The Largo is Chopin at his best: an exquisitely-judged haven of tranquillity. For the Finale, he unleashes music of rhythmic vigour and complexity, the cello-writing showing that, with Franchomme's help, Chopin's understanding of the instrument had reached its peak. Franchomme was a composer in his own right, and his rarely-heard Three Themes, based on music by Donizetti, Beethoven, and Bellini, represent one of the CD's highlights. Franchomme also collaborated with Chopin on the charming Grand Duo based on themes from Meyerbeer's opera, Robert le Diable. The work begins with the impressive piano introduction one might expect from Chopin, before Franchomme's cello part joins in to create a duet of melodic richness and beauty. The piano used in this recording is a 'double piano' manufactured by Pleyel in 1898.